Those of us who have fished this coast and enjoyed its wealth know that this project will cause immeasurable damage to our ocean and quality of life. 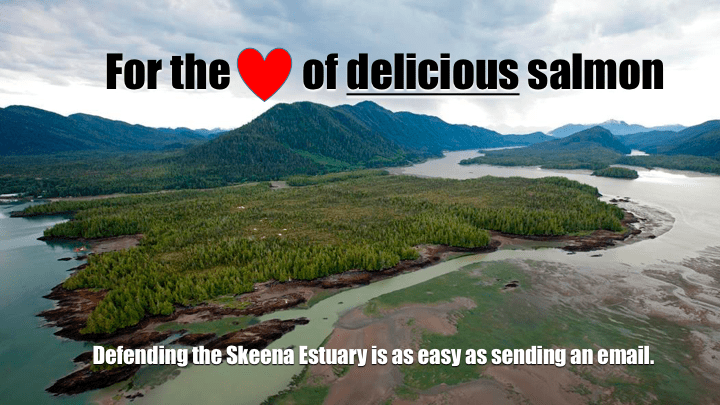 Indigenous knowledge and western science say the same thing: The Skeena Estuary is no place for industrial development. The Lax Kw’alaams community knows this – in May they voted to oppose Petronas’ project and rejected a $1.15 billion-dollar deal. For the past six months, the Lax U’u’la have been occupying Gitwilgyoots territory. They are asserting their Indigenous rights and defending their abundant wild salmon and way of life. In January, hereditary leaders from the Skeena Watershed, as well as northern MLAs and our MP, signed the Lelu Island Declaration stating that the estuary must be protected from industrial development. A team of Russian scientists toured the northwest last month—they spoke of their experiences with an LNG plant on Sakhalin Island and cautioned that Petronas’ plant could decimate Skeena River salmon runs. 1. Email your comment to the Canadian Environmental Assessment Agency. Tell CEAA and Canadian Ministers why you oppose Petronas’ Pacific NorthWest LNG on Lelu Island. There’s a form statement below that you can copy, paste, and personalize as you like. 2. Send this to 3 friends and encourage them to write their letters of comment, too. This is the last opportunity for citizens to have their say in this review process. Every voice counts. P.S. Here is a link to an online form that makes letter writing simple and quick brought to you by Friends of Wild Salmon. I write to you from Haida Gwaii, a pristine and vibrant archipelago off the northwest coast, to express my deep concern for the health and well-being of my mainland neighbours. The Skeena Estuary is an incredibly important and rich ecosystem that provides our northern communities with wild salmon, halibut, shellfish and seaweed. We live off of these resources, and fishing helps to contribute to our economies and overall well-being. Flora Bank, adjacent to Lelu Island, is an essential eelgrass nursery that salmon and eulachon need to survive. Indigenous knowledge of this area states its unique importance, and independent science dating back to the 1970s verifies Flora Bank is critical to their survival. The adverse effects of the Pacific NorthWest LNG plant proposed on Lelu Island cannot be mitigated. Our communities and cultures throughout the entire Skeena watershed will be negatively impacted if the proposed plant is built. I implore you to reject this project. This entry was posted in News and tagged coastal ecosystems, defendourcoast, environment, LNG, pipeline project, salmon by haidagwaiicoast. Bookmark the permalink.